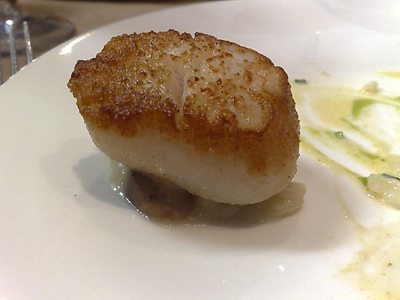 On a cold and rainy Sunday, we've sought comfort in the company of some good French food. 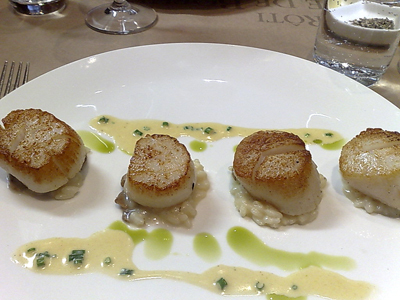 I've chosen the scallops with mushroom risotto - a dish that we both loved on our previous visit. 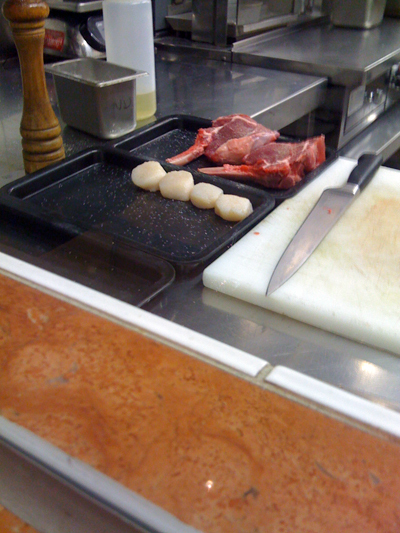 Seriously good scallops, barely cooked to retain their tenderness, sweet and succulent they would be perfect just by themselves. However they have a wonderful companion in the form of a creamy mushroom risotto. With our meals we are thoroughly enjoying this bottle of 2005 Alto Moncayo Veraton Grenache. 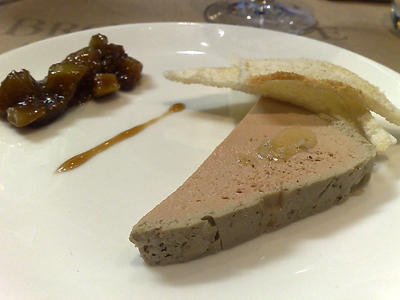 A little treat from the kitchen is next - a sampling of their duck liver parfait with a fig and sultana chutney. 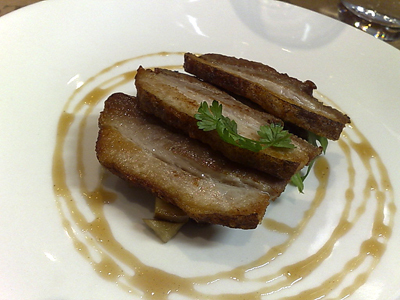 An incredibly light texture combines with that distinctive flavour of duck liver. The hint of smoky cinnamon in the chutney and the sweetness of the figs helps round out the flavours. 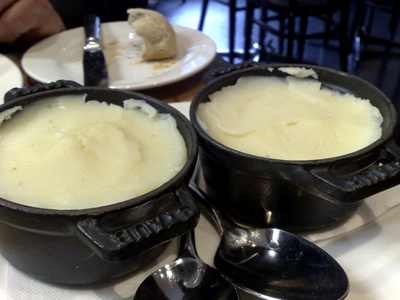 With a choice of pommes frites or Truffle Mashed Potatoes - the mashed potatoes easily won that battle. 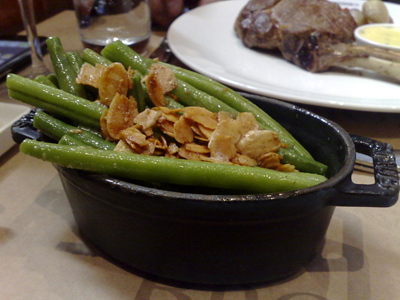 We also ordered a side of greens beans served with almond butter. 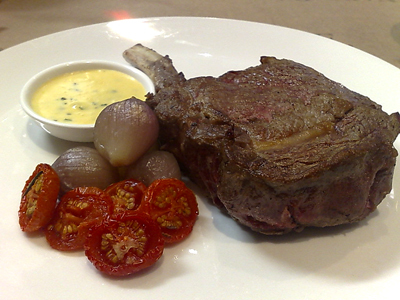 An excellent piece of beef - tender, juicy, flavoursome and cooked beautifully rare. 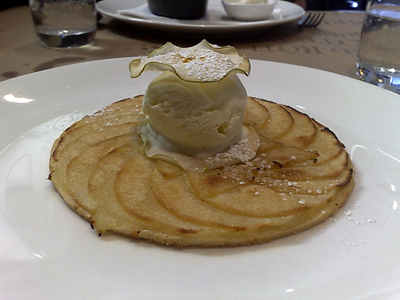 I have the French Apple Tart - a thin circle of buttery pastry is topped with equally thin slices of apple. Baked until golden it is served with vanilla ice cream and dried apple slices. 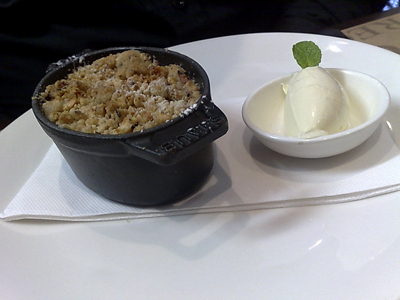 Paalo enjoys the blackberry, rhubarb and apple crumble topped with a hazelnut crust and served with vanilla mascarpone. Baked in its staub pot it arrives hot from the oven. 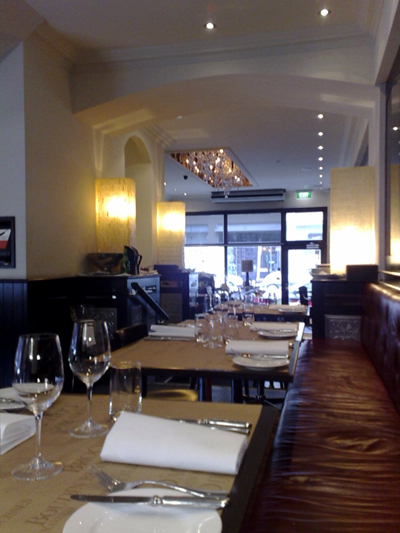 A highly satisfying way to spend Sunday - good food, good wine and good conversation.